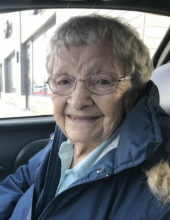 Pauline Brown, 99, of Mt. Pleasant, passed away Sunday, January 27, 2019, at her home. Cremation has taken place and no services are planned. Pauline was born December 28, 1919, in Kalamazoo, Michigan, daughter of the late Paul Edward and Cecilia Violet (MacDonald) Dougherty. She is survived by five children, Paul McMullen of Mt. Pleasant, James (Cecilia) McMullen of Sweden, Russell McMullen of Mt. Pleasant, Peggy Thrush of Mt. Pleasant and Barry Brown of Mt. Pleasant; many grandchildren, great grandchildren, and great-great grandchildren including special grandchildren, Stacy Kerr, Troy (Kevin) Brown, and Heather (Adam) Stuller; and two sisters, Catherine (Dan) Currier of Kalamazoo, and Mary (Bill) Leveque of Kalamazoo. She was preceded in death by her parents, Paul and Cecilia Dougherty; husband, Basil Brown; sister, Patricia Plumb; and favorite aunt, Marie Cole. To send flowers or a remembrance gift to the family of Pauline Ruth Brown, please visit our Tribute Store. "Email Address" would like to share the life celebration of Pauline Ruth Brown. Click on the "link" to go to share a favorite memory or leave a condolence message for the family.